I travel north and south on a particular highway several times a year that also is frequented by very long tractor trailers carrying wind tower blades to destinations unknown. I get excited when I see them. 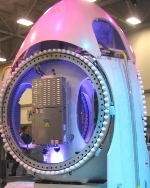 So you can imagine the "child in the candy store" feeling I got as I walked three hours through the Windpower 2010 Exhibition in Dallas recently. The floor supported about 1,400 booths, some of them with two floors. The variations of the blades, the sizes ─ both large and small ─ of the turbines, the safety equipment for maintenance and repair workers, and even the international pavilions were dizzying. I was comforted by the sight of known companies such as ABB, Black & Veatch, CH2M Hill, DNV, GE, Malcolm Pirnie, Oldcastle Precast, Tetra Tech, TYCO, Schneider Electric, and Siemens. For an industry that reports a slowing first quarter, it sure looks as if there is some money to be made. This was the first exhibition I have attended where I saw state booths. The states with wind are hoping to attract developers and install farms to create jobs and help their economies. Talking casually with several exhibitors, I came away with the impression that the industry is here to stay. Just think, Altamont Pass in Northern California is home to one of the nation's oldest wind farms, beginning construction in 1981. The farm has about 4,800 small wind turbines and, although it has to shut down during parts of the year to safeguard area raptors, the units still provide some power. It's been a bit of a learning curve as developers consider the environment. But every site has its permitting issue and hazards, doesn't it? Do you see a significant downside to wind energy generation? If you compare it to fossil fuels, how does it fare? Here's another perspective from the Western Institute for Study of the Environment.